Mala beads, mindfulness, and breathe! Morning blogger friends and season's greetings to you all - I hope the festive period is treating you well, however you want it to be! My children gave me 'the little book of mindfulness' for my Christmas present this year. It's a way of being that I think about a lot and try to practice every day - I was thrilled with it, and with the fact that they know me so well! Mindfullness, as I have mentioned before in this blog, is the practice of trying to live in the present moment - paying conscious attention to NOW. It isn't always easy - that is why we have to practice it! 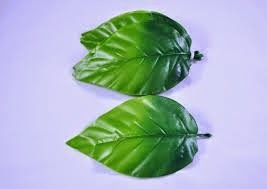 "The breath provides a natural gently moving target to focus on in your meditation; it grounds you in the hear and now. You cannot take a breath for 5 minutes ago, or for 5 minutes' time. You can only take a breath for now." To help with breathing, the book suggests repeating a mantra - it can be as simple as 'I am breathing in, I am breathing out.' It's a very personal thing and I guess in time you find your own mantras which help you. I like this simple one though - it's a place to start. This section of the book went on to mention counting breaths to keep you a bit more focused, which really appealed to me! 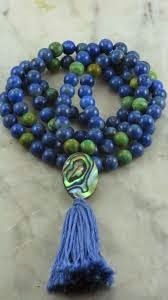 The use of mala beads was suggested. Mala beads are actually Buddhist prayer beads, used as a traditional tool to count the number of times a mantra is recited whilst meditating. 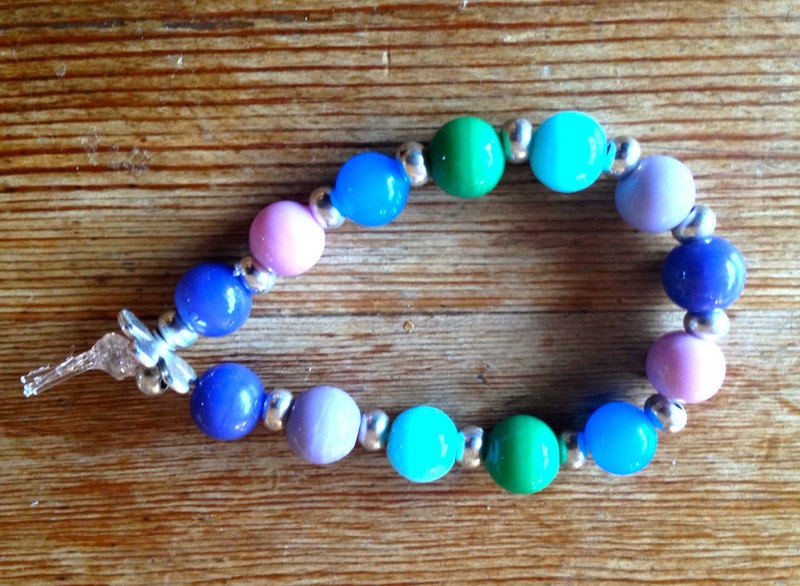 Here they suggest using each bead to count a mindful breath. So Jess (11) and I went shopping this morning for beads and bracelet thread. I wanted a make a mala bracelet to wear all the time as a reminder to me and as a ready tool of mindfulness. We came home and made it straight away, and here it is - a bead for each special mantra breath, and a little flower to remind me 'to stop and smell the flowers!' To start with, my aim is to sit quietly once a day and breathe a bracelet-ful of mindful breaths, counting along the beads as I do so. It seems to me a small but very important daily thing to do. I hope you enjoyed reading my blog, and I am always pleased to hear from you. Hello blogger, Facebook, Folt Bolt, newsletter, twitter, and tsu friends! 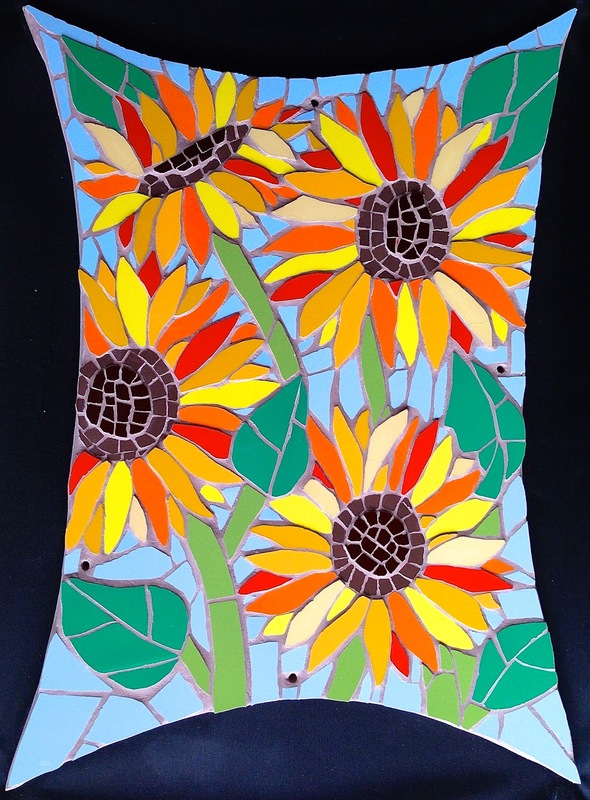 Thank you SO much for all your likes, comments, shares and support for my special December mosaic sunflower giveaway! I have had over 200 entries, which is amazing and much appreciated. 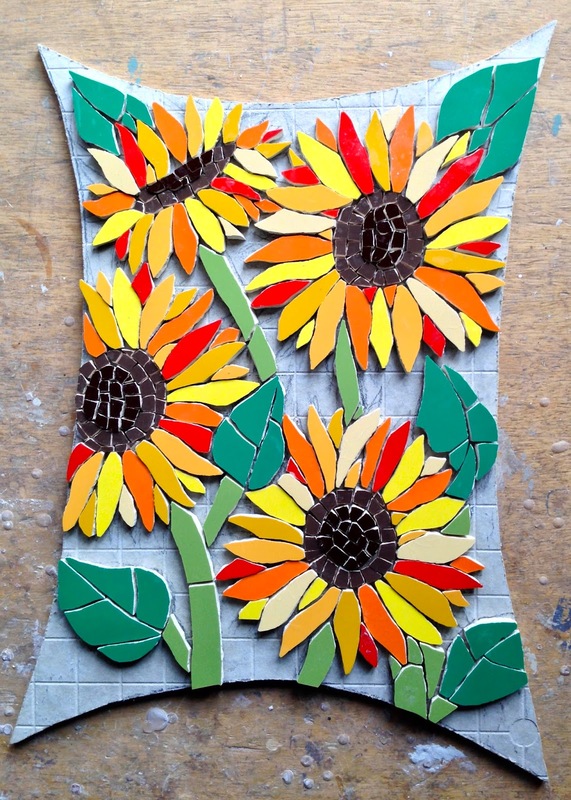 Before I announce the winner, can I just say that so many of you seemed to love my sunflower, that IF you don't win the mosaic, I would be very happy to make you one for a special price of £30 (normally £37) incl. UKP&P (or £35 RoW). I have a big commission in January 2015, so wouldn't be able to make it until February. Please email me if you would like to order one - felicityball@justmosaics.co.uk - and I will send you a PayPal request nearer the time. Congratulations, Connie - please email your address, and it will be on its way to you very soon! Thank you SO much everyone - do subscribe to my blog if you enjoy reading it - just put your email address over there on the right - you would be very welcome, as always! A new social media platform for my mosaics! I hope this find you well and looking forward to a change (not necessarily a break!) over Christmas. 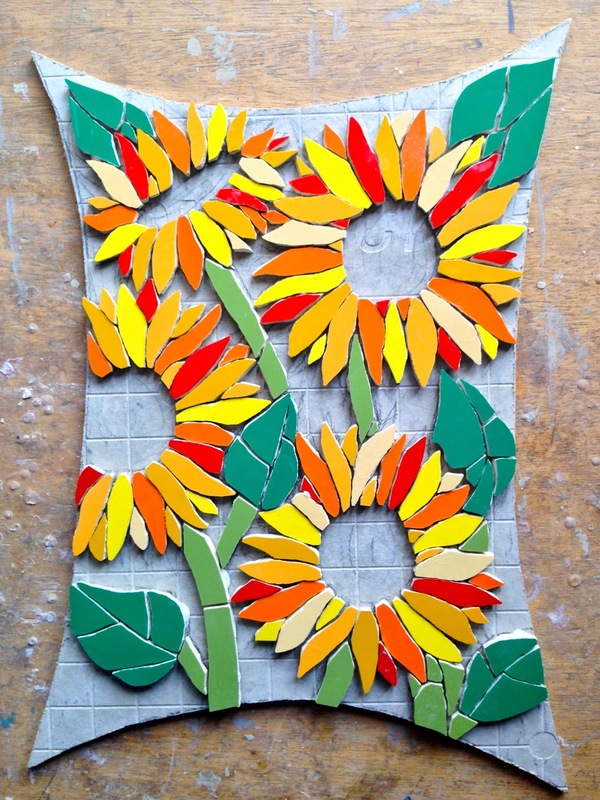 I finished the sunflowers mosaic - just need to pack it up and send it off now - used our 'proper' camera to get a good photo of it for you - what do you think?! I have launched a new range of mosaics this week too - I have called them 'flower gems' as they are small and precious, and only £20 incl UKP&P £25 RoW. I am going to make them in all sorts of colour combos, grout colours, using millefiori, glass beads and so on - anywhere my imagination leads me - can't wait! 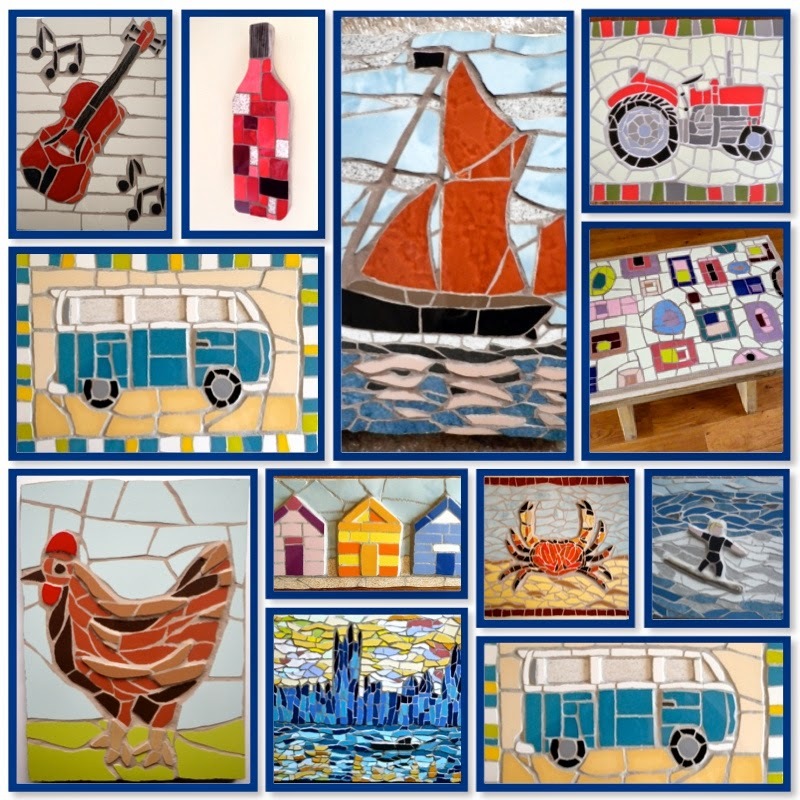 I have a few events coming up where smaller mosaics will be just the ticket! 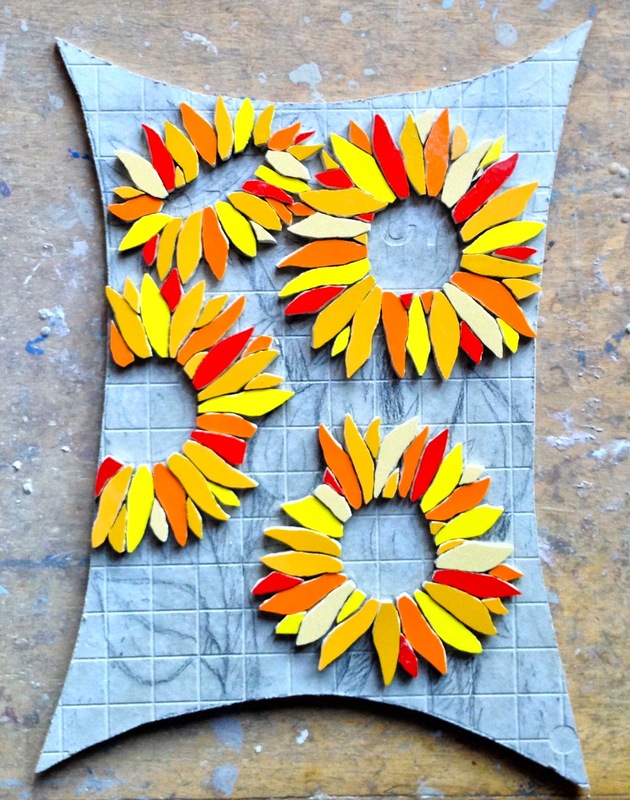 It's been a week full of sunflowers here at mosaic HQ! - just as well as we have been hit by this new phenomenon to us in the UK, a 'weather bomb'! I have been so looking forward to making this commission. 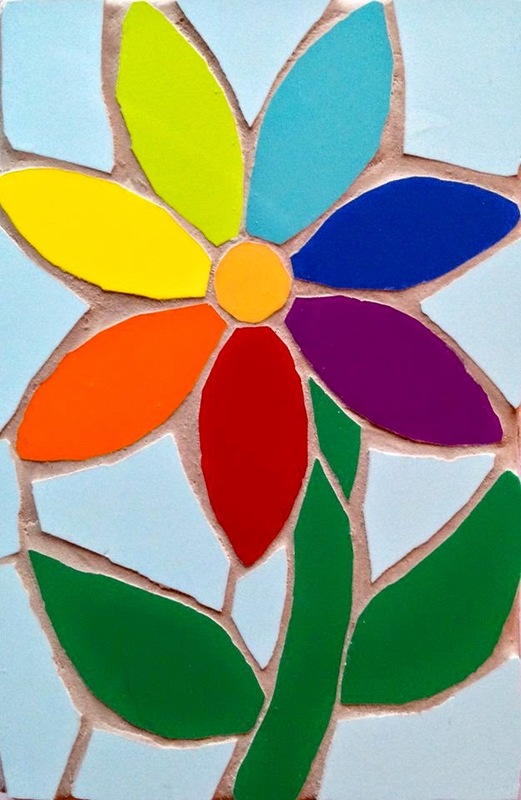 My customer wanted a sunflower exterior mosaic in the shape of my spring flowers mosaic (see below) and the rest was up to me! I have taken photos for you along the way which pretty much speak for themselves. As I write, it is not finished yet - I have to choose the right shade of blue for the sky, grout it and then paint the sides and the back with weatherproof paint. I use two coats of Cuprinol shades paint - brilliant coverage and colours! First, the design - I looked closely at heaps of images of sunflowers, their stalks and their leaves. Choosing the tiles from all my lovely sunflower colours is always tricky, but more isn't necessarily better, so I stuck with these little beauties! ....and then the very intricate seed centres! 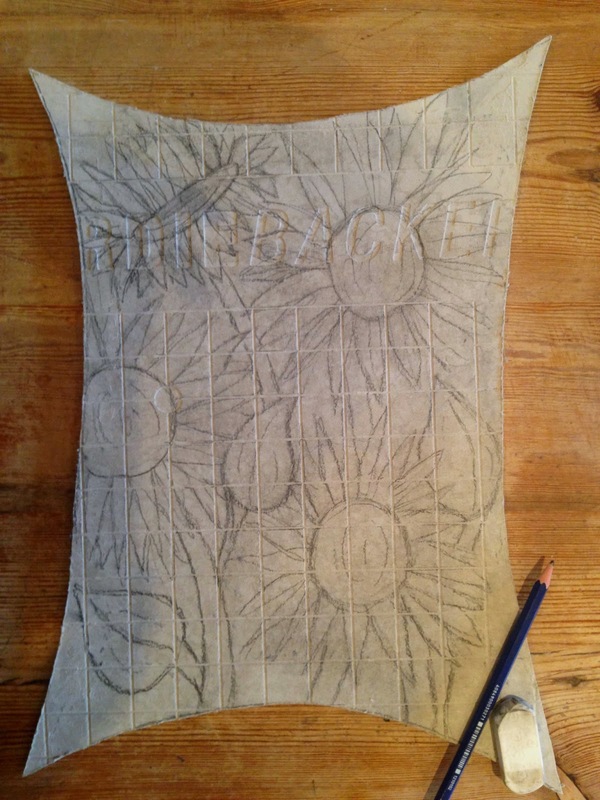 As you can see, I have used two different shades and depth of brown tile to give the seed head a rounded, 3D effect. And that's where I am up to at the moment - I will post a picture of the finished mosaic next Friday when all is done! I really am pleased with it, and have enjoyed working with these lovely sunny colours. Thanks so much for reading my blog- do leave me a comment and give it a share - every little helps! Same time, same place next week?! 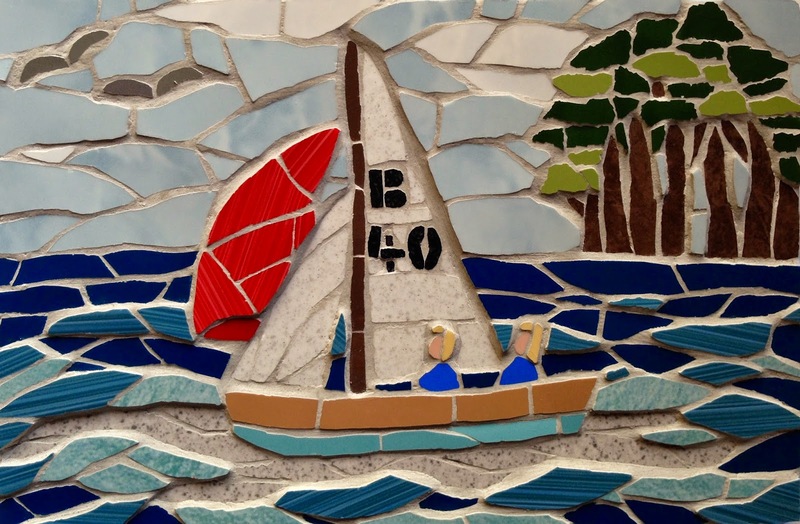 Felicity Ball mosaics blog NEWS! ....to you all, from all over the world! It's a funny old thing, a blog because you don't really know sometimes as you sit down to write it, if anyone is listening! It's not really the point, of course, I simply enjoy writing it - increasingly so over the past year. I have lots of ideas for interesting and varied posts for you, and hope you're out there enjoying them! I have always valued my blog, planned and researched it carefully so I hope it is always worth a read. I have a delicious hour or two on a Friday afternoon to myself and plan to write it weekly then - so you may like to have a look at it over the weekend with a coffee or a glass of something! I love to read your comments so do leave one - I ALWAYS read them and reply. This is a living, breathing blog!! Also, and rather importantly at the moment , it is MINE! I am in control of what goes in and when and how often, with the help from your valuable feedback and engagement. Facebook are changing the rules about post reach in the new year which means it is more difficult to reach you, that is if you want to be reached! Of course, my Facebook page - www.facebook.com/justmosaics.co.uk - continues to buzz as before in the hope my posts pop up in your newsfeed - just click on the 'get notifications' tab under where you liked my page. During the week, I have a sticky memo note on the desktop of my laptop and jot down things to include in my Friday blog for you, so look forward to catching up with you then! Please share my blog with anyone you think might be interested in my work - thank you! 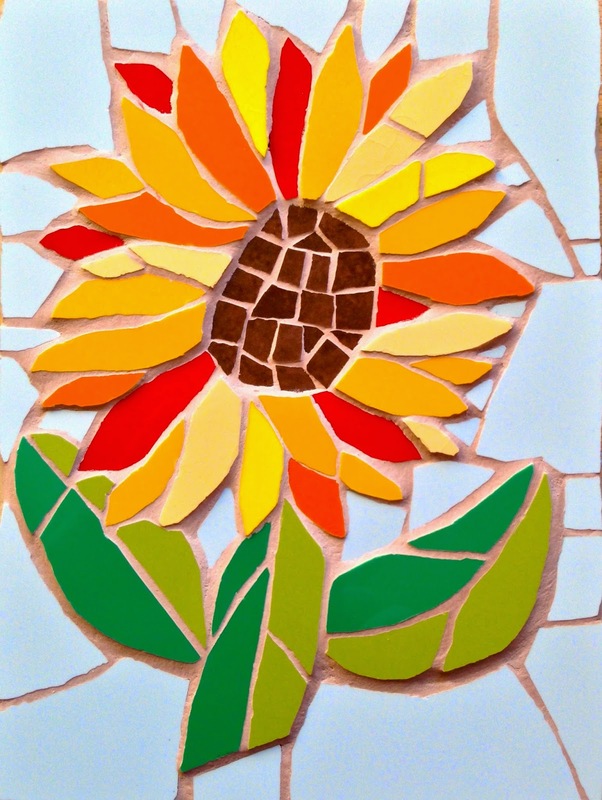 I am having A SPECIAL DECEMBER SUNFLOWER MOSAIC GIVEAWAY! To enter, just leave me a lovely comment at the bottom of this post with your email address, or email me directly - felcityball@justmosaics.co.uk - oh, and please tell all your friends about my original mosaic art - simples! I will draw the winner on Dec 21st 2014 at 8pm GMT, and let you know here in my blog. Thanks, blogger friends, look forward to hearing from you, and don't forget to spread the word! 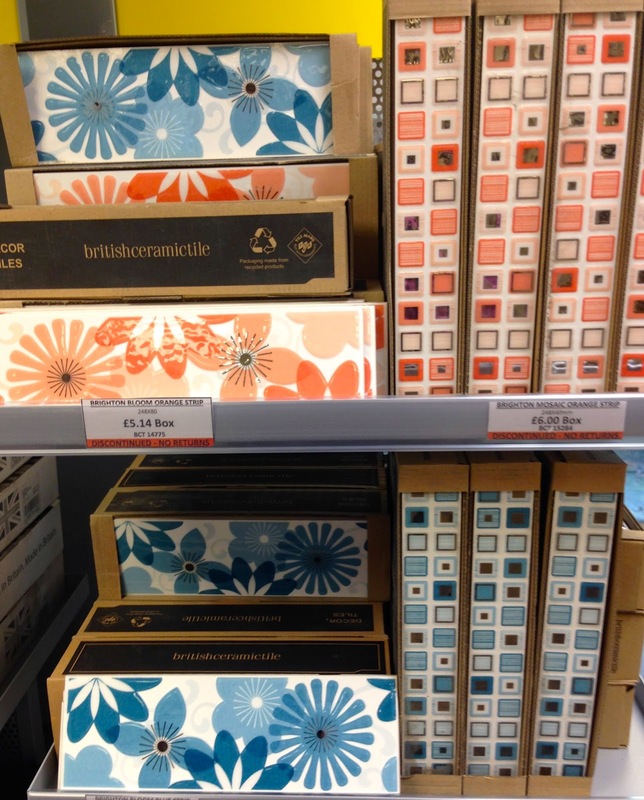 A visit to the British Ceramic Tiles factory shop - mosaic heaven! 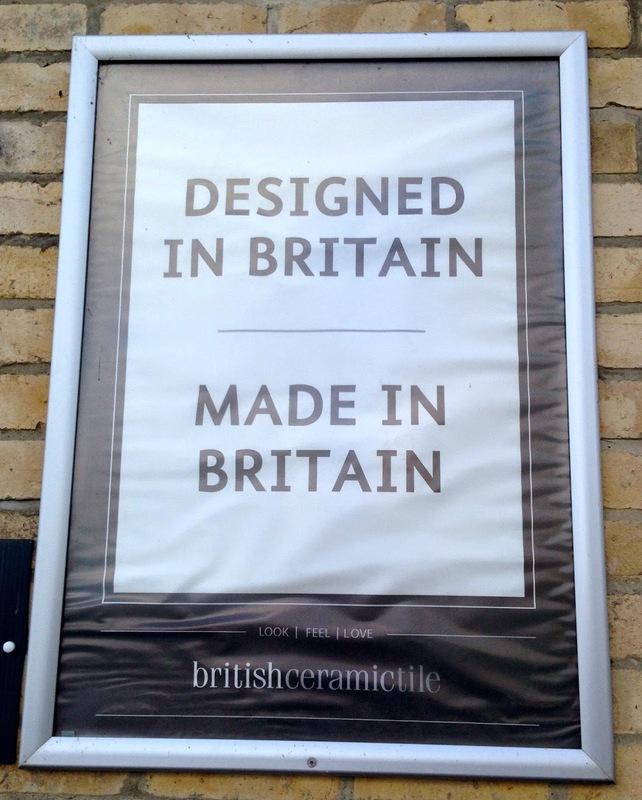 On our way down to Cornwall last week on a research trip for some commissions, we stopped off at one of my favourite places in the world, the British Ceramic Tiles factory shop - yes, heaven for me! instead of the factory shop - but all was well as we realised our mistake, and it was great to see the raw materials of tiles, and where they start from! One day, I will pluck up the courage to ask to have a look around. ...and then these gorgeous coloured glass tiles which are too thick for me to cut, but look at those colours!! Oh yes! - as you can see from my trolley (1 of 2! 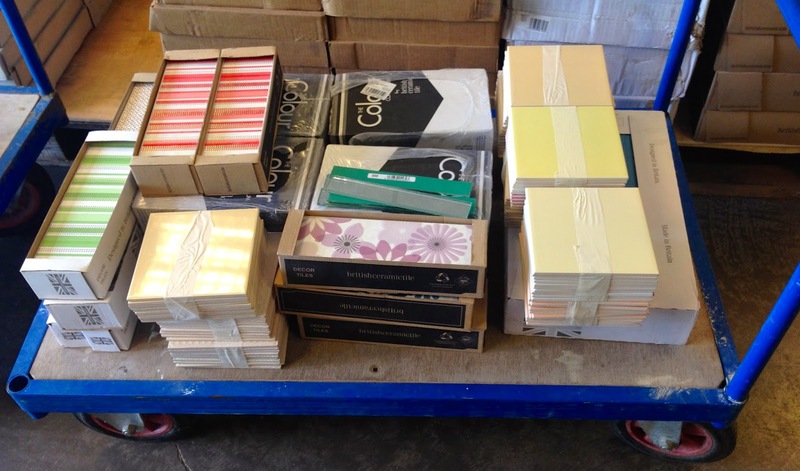 ), I had a lovely time and am stocked up for the next few busy months - but am always on the tile look out! The car was a lot heavier driving away, I can tell you - until the next time BCT....! I love being commissioned to make a completely original and personal mosaic. I love a challenge and to find ways of creating something new with tiles. So, it all starts with a customer liking my mosaics, having an idea of a special mosaic and getting in touch. This particular customer, Ellie, lived close to me so we arranged for her to come round and have a chat. She wanted me to make a mosaic for her sister's 40th birthday. In it, she wanted a particular sailing boat her and her sister sail in on the Sussex coast, some trees suggesting the New Forest, a 'B' for her sister's initial and 40 on the sail. We chose a range of tiles that she liked, and I could work with. Then she left it up to me. 'Right,' I thought - 'interesting!' I firstly researched the sailing boat she wanted, and found an image of the sideways view I was looking for. Then I looked for clumps of trees in the New Forest, and found an image of one that would work in the mosaic. I started by drawing the design on the wood, and when I was happy with the proportions and detail, I got on with some snipping and sticking! As I was making the boat, I realised that it needed people in it - and who better than Ellie and her sister?! So I found out what colour her sister's hair was, and what colour life jackets they wear - it's all in the detail! Better have some seagulls too .. And here it is....! I so enjoyed it all - love to make something new! For watching, sharing and remembering ..
Make no bones about it, friends, my Facebook page - www.facebook.com/justmosaics.co.uk - is very important to me and my mosaic business. I held out getting one for a long time for ignorant and stubborn reasons - I freely admit it. I didn't know how it all worked, I had heard all the negative stuff about Facebook and it just wasn't me - how wrong was I?! I paid someone to set up my first Facebook business page, which was good and bad. Good, as it gave me an introduction to how things worked etc (not so scary after all) - but bad, because I had to go through this administrator every time I wanted to post something. In the end, I realised it wasn't really a reflection of me - there was no spontaneity or personality about it. I sincerely believe, that if you are going to connect with an artist online, you need to 'know' the person a little, trust them, get a sense of who they are and how they work. So two years ago, to the day practically, I told this administrator, I wanted to run the page myself, and within five minutes, it had been shut down with all the posts and likes I had built up gone ... yes GONE! - shattering - boy, do you live and learn?! So I started up again myself from scratch. It wasn't easy at first, but I felt SO much happier doing it all in my own way, and letting followers get to know me a bit, if they wanted to, that is! Over these two years, I have tried to find ways of making my page interesting, and a place where people want to come back to and interact with. I really enjoy the whole experience. And then, of course, lovely people BUY my mosaics which never fails to give me a buzz :-) - liking them enough to want them in their houses and spending real money on them - amazing! Whether it is an order from my website - www.felicityballmosaics.com, a commission or a post-the-next-day purchase from my Facebook shop https://www.facebook.com/FelicityBallmosaics.co.uk/app_109411145786630 - they honestly all mean a great deal to me. I am not good at selling my work, and that's a FACT! It's all too personal and does something funny to my insides! 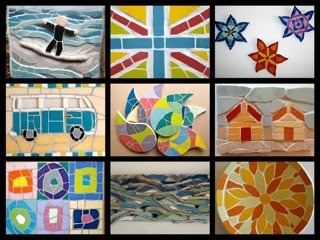 So, to have my Facebook page and be able to showcase my mosaics, is invaluable to me, and I never take it for granted! I can make a new mosaic during the day, post a photo of it in the evening and it can be off to someone's house the very next day - how fabulous is that! But it's not ALL about mosaics on my page. I am very much enjoying sharing my 'take a moments' with everyone, encouraging us all just to stop for a moment and 'smell the flowers' in our busy lives. I love sharing other artists work - there is so much out there to be introduced to and appreciated. Our dog, Pip, my faithful companion, gets a showing from time to time (sorry non-dog lovers! ), as do short films, the odd funny, discussions from the newspaper, your advice on a mosaic, links to blogs and articles, and so it goes on. I aim to keep my page lively, interesting, varied and buzzing - and in turn, fb friends are kind enough to like, share, comment and order - what a great partnership! So if you are one of my Facebook friends, THANK YOU, don't stop, and why not subscribe to my blog - see right? And if you are one of my blog friends, THANK YOU too, and come on over to my lovely Facebook page - www.facebook.com/justmosaics.co.uk - give it a like and join the gang! 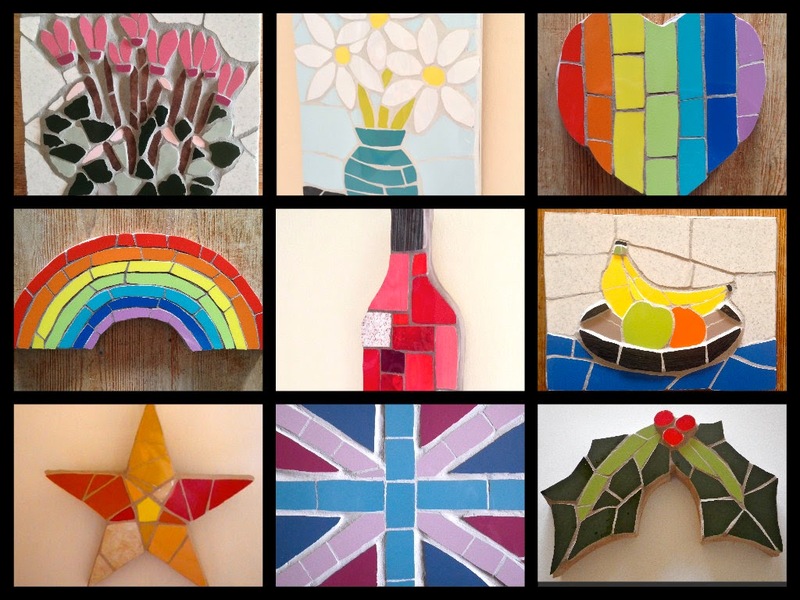 Check out my original mosaics this Christmas! Well, it's coming up to that time of year again, and I know you will be bombarded with catalogues, and social media stuff and shop sales, all trying to persuade you that theirs are the Christmas gifts you have been looking for! I'm not sure why I think I am any different - I am just a mosaic artist working from my studio at home, creating mosaics unlike any others! You'll be glad to know that I am not very good at the hard cell, it's just that my mosaics really are lovely and vibrant in real life, and DO make unique presents - there done! If you would like to order one of my mosaics to arrive in time for Christmas, please can you order very soon from my lovely website, as they take me a while to make for you - www.felicityballmosaics.com All my prices include UK P&P, and I try to keep them as reasonable as possible, as I love to be busy! So, why not pop over there now, and see what catches your eye? 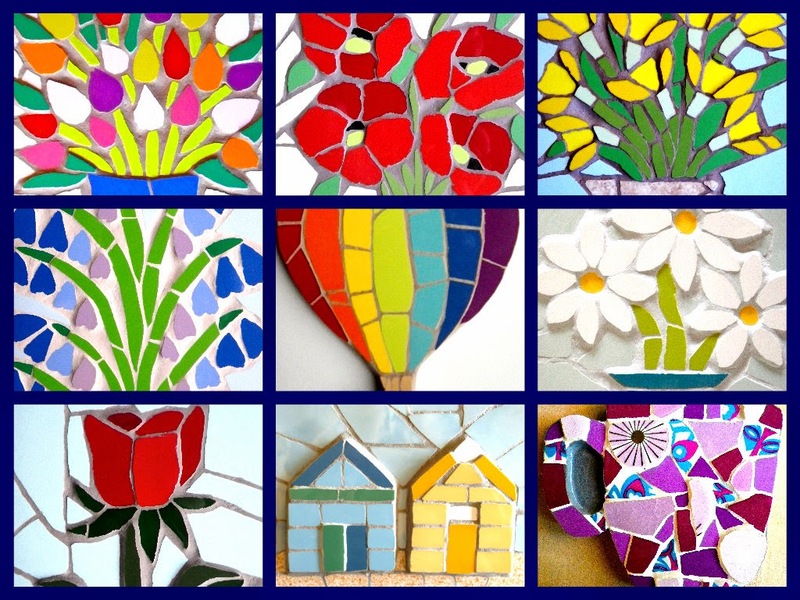 Here are some small collections of some of the mosaics I make - I cut each tile individually and each design is original - perfect for any occasion or to enhance any space, inside or out! Which is your favourite? I would love to hear from you. 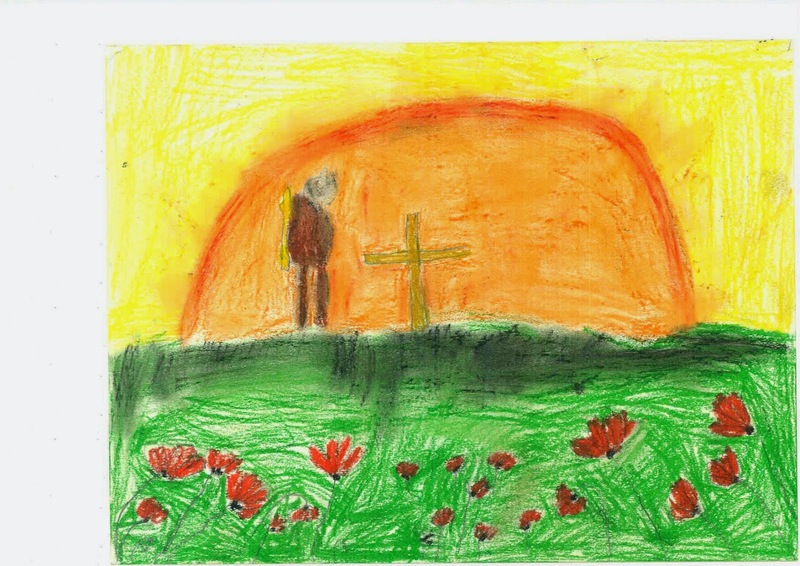 I have been thinking a lot about Remembrance Day in November. It is such a moving time, and I have no real idea what it must have been like for those who didn't come back, and for those who did. All we can do is remember them, in gratitude. I have been collecting some images for short Remembrance Day film I am going to make - nothing Hollywood - just something I have thought of which might us help not to forget.. I am hoping it will come together well, though, if my past experience with iMovie is anything to go by, it may take a while! Do keep a look out for the film, and I hope it helps you to take a moment to remember.. I just wanted to share with you my latest mosaic, which makes me feel very happy! I love the thought of my client coming home to it every day! 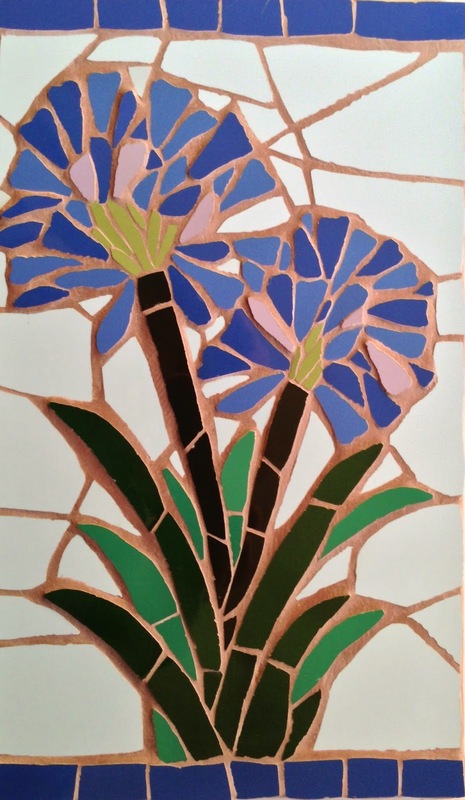 Mosaic agapanthus flower picture - and how I made it! Have you checked out all the new features on my side bar..? I have been hard at work trying to make my blog an even lovelier place for you to visit - what do you think?! My latest commission was an agapanthus mosaic, which has been tricky, I can tell you! I took loads of photos of them when we were on holiday in St. Ives, Cornwall this year - they were GIANTS compared with the ones we have in our garden. So, I've been looking at those for inspiration, and Google images is always a good source of info. I drew the general shape and perspective on my piece of exterior plywood first, then went to my vast palette of tiles to find the right blues/purples. I wanted different depths of tiles to bring the mosaic to 3D life, and different textures as well. When you see one of my mosaics in the flesh, as it were, you'll know how important that it is, and what a difference it makes! 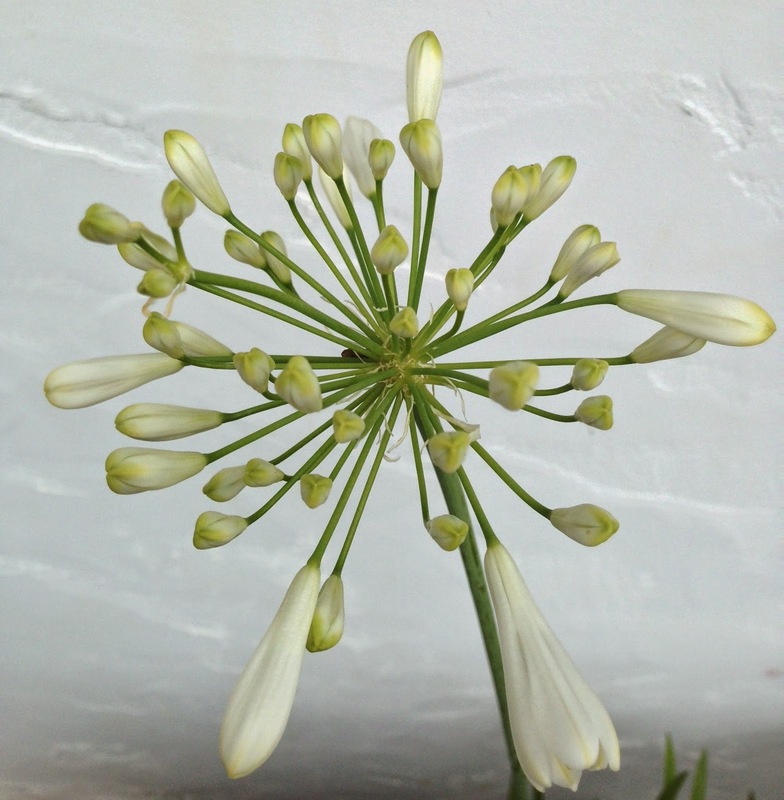 My first agapanthus blooms were too light - I had too much of the light purple in them, so I took them out with my trusty screwdriver. 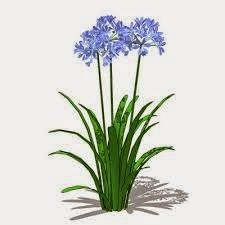 Already it looked better - more delicate and true to that gorgeous agapanthus blue. I added a few more flowers of the darker blues to give it that rounded feel, of one flower, made up of many flowers, cutting each piece carefully to fit the space, but not too perfectly as nature isn't like that, is it?! Happy with the blooms, and after a good coat of looking, the stem and the leaves were easy - I had just the right shades of green to give them a feeling of shadow and life. I did put a leaf above the blooms - but NO! 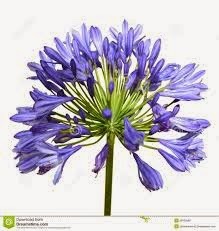 - that was all wrong, and in all the images I looked at of agapanthus, none of them had leaves above the blooms - so, out it came! I like borders sometimes, and I just felt a border at the top and the bottom, in that lovely blue, would emphasise the height and colour of the agapanthus, and I am really pleased with how it turned out. Finally the grouting in my faithful brown tinted grout which never fails to bring all colours out beautifully, and painting the sides and the back in a contrasting blue - done! And here it is ....always better in real life, of course! I love a challenge, and this mosaic certainly was one - but it's lovely to be asked to make different mosaics and see what I can come up with! If you have a crafty friend who you think would enjoy my blog, it would be great if you could share it with them. I now have a very smart tab on the side section over there (points right!) for you to receive my posts by email if you would like - set it all up by myself, I did! Thanks for reading and I always love to hear from you! Just Mosaics is now Felicity Ball mosaics! Just to let you all know that I have changed the name of my original mosaic art business! I have been thinking about it for a while, and I send off my latest big commission, I thought it was either now or never. I asked far too many people for their opinion, until my brain felt scrambled! Then one morning I woke up and thought - 'Hey! This is MY business and If I want to change its name to make it more personal to me, I will!' 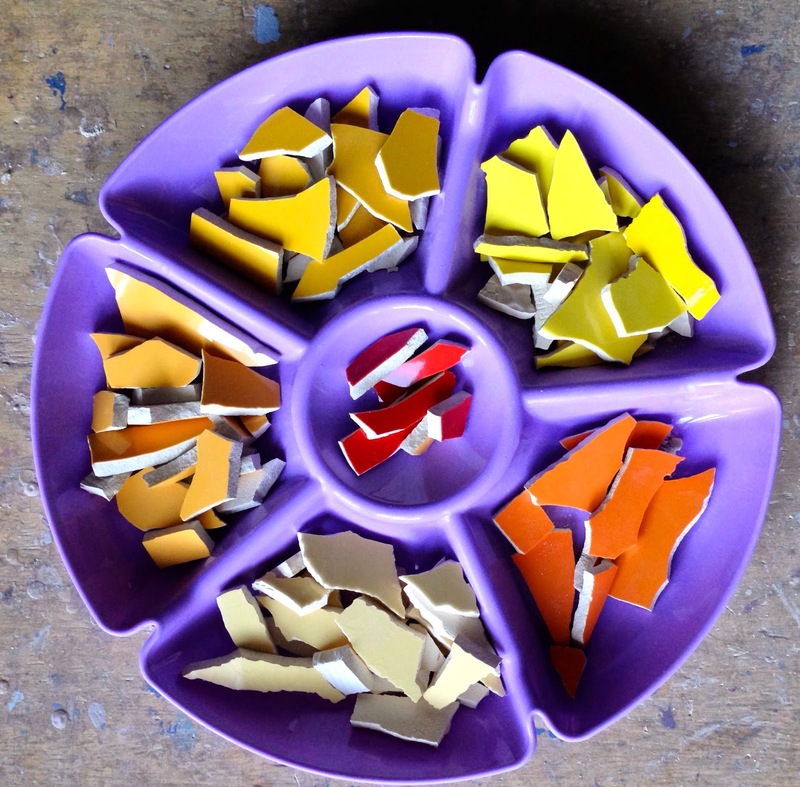 - so after a lot of sorting out, I have - welcome to Felicity Ball mosaics! I love my new branding too - it's really given me a boost! Dare I ask, what you think ..? Also blogger friends, if you like reading my blog, please would you share it with people you think might enjoy reading it too? THANK YOU. A step-by-step guide to making an exterior mosaic. 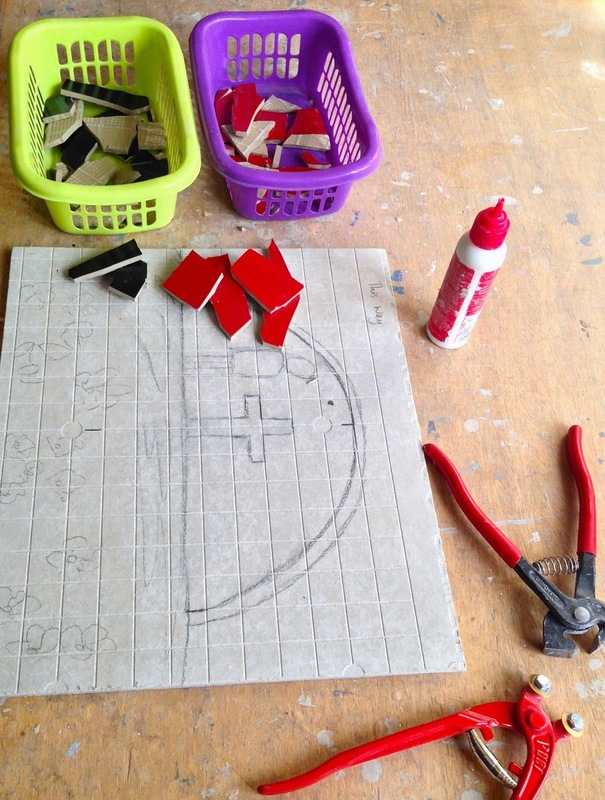 Here is a step by step guide to making one of the Crossley Park mosaics, commemorating the First World War. This is the painting I based my mosaic design on. 1. 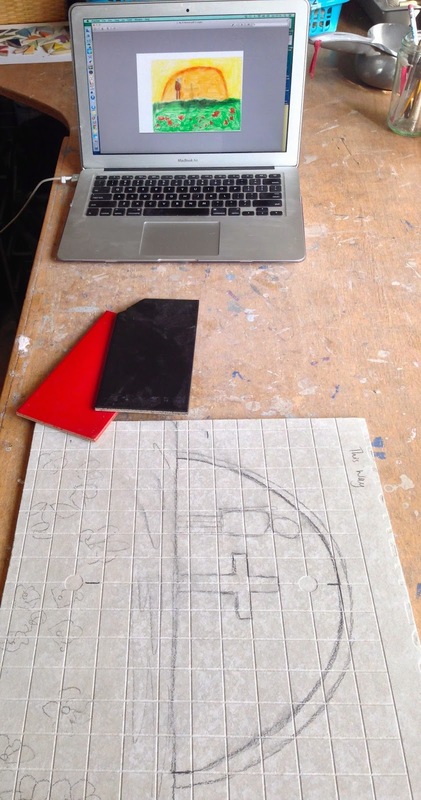 I used cement board for all the mosaics, as it is completely weather proof, and drew the design onto it with a soft lead pencil, making sure I had the board the right way round. 2. 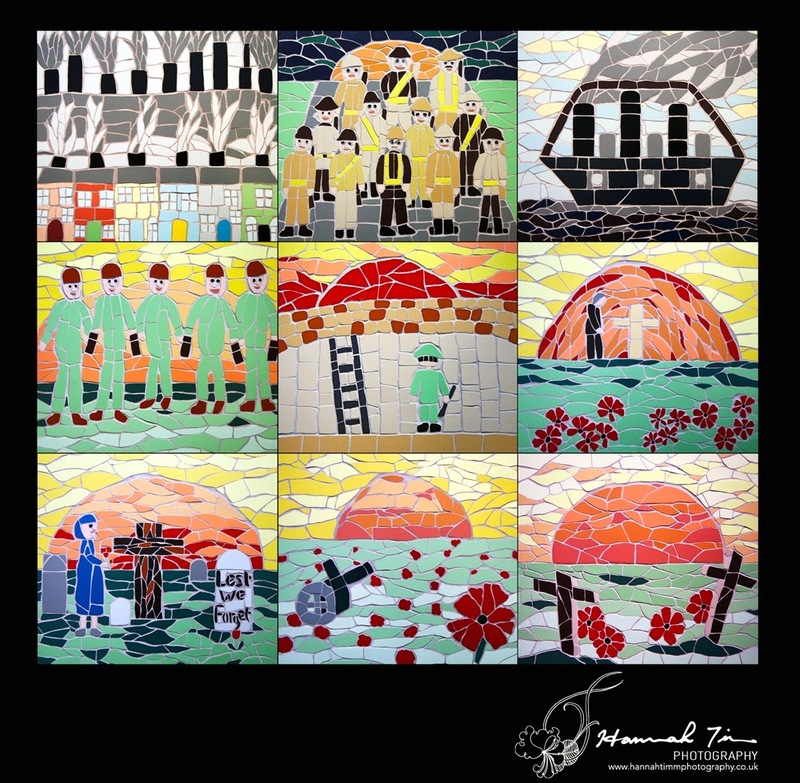 I took each of the designs from pictures local school children had painted of their feelings and impressions of the First World War, which they had been learning about in school. I had all the paintings up on my computer so I could keep to them as closely as possible, while putting my own stamp on them too. 3. Choosing the right colour of the frost-resistant porcelain tile I used for all the mosaics, was a very important part of the process. Luckily, I had a wide selection of colours to choose from. 4. So, the snipping and the sticking started. The poppies seemed a good place to start. I looked at images of poppies on the computer, to get the shape and size of the petals just right. Although it made filling in the green background of the grass more difficult after, I wanted to space the poppies out as in the painting. 5. The grass came next. I used two different shades of green to bring texture and relief to the grass around the poppies, cutting the tiles to achieve this undulating effect. 6. The cross in the middle of the mosaic was central to the message of this piece, so I kept it very simple, using as much tile as I could, so that it would stand out. 7. The person by the cross had to be simply made too - a sort of everyman or everywoman figure, mourning the terrible loss in the First World War. 8. In contrast, behind, I made the sunset vibrant, with a lovely curving movement to it. I saw it as signifying hope. 9. Finally I made the zesty yellow sky, uplifting the whole mosaic - using different shades of yellow to bring variety and texture. 10. With the snipping and sticking finished, I grouted the mosaic with a waterproof beige grout to bring out the colours, cleaned and sealed it, and here is the finished article! I hope you have enjoyed reading my step by step guide to making a mosaic, and that you enjoy seeing all the mosaics in Crossley Park, Ripley, Derbyshire. Here are all nine mosaics together!